Excited for Spring? Of CORAL We Are! Spring is a time to declutter and reinvigorate old spaces in your home. 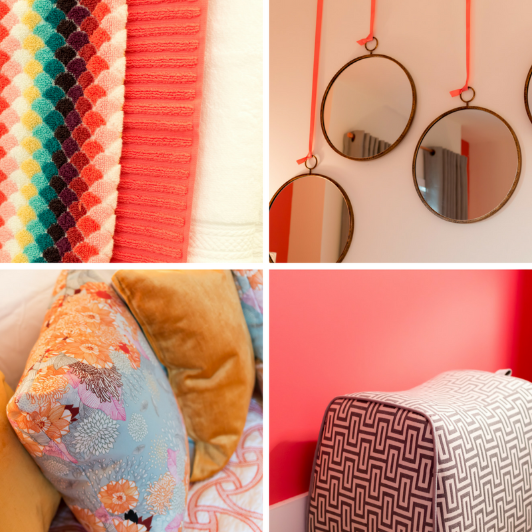 Get inspired with this bright coral-infused bedroom we designed for Parallel Travel in Stacks on Main in East Nashville. As an Airbnb space, we wanted the room to feel comfortable and warm but also fun and energizing. What colors are you leaning toward this spring? We couldn’t be more excited that warmer weather and warmer color palettes are coming our way! Instead of our usual tips this month, we wanted to share some eye candy to inspire your next reno project. Start small by refreshing an old piece of furniture with a new coat of paint or go big with a complete room remodel. Either way, have fun with it and don’t be afraid to be bold!